Since then, a Joint Implementation Committee (JIC) was formed and progress was made in developing roadmaps for workforce development, business development, community engagement and environmental stewardship and community investment. 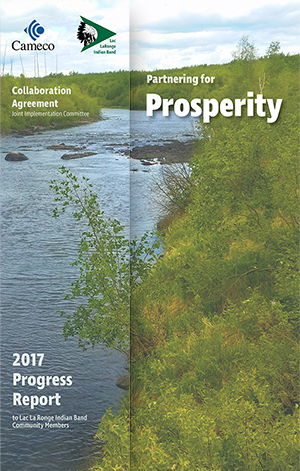 To provide more information to band members about the progress made under the collaboration agreement, the JIC has released its Collaboration Agreement - 2017 Progress Report. Notably, as part of the Collaboration Agreement, the LLRIB, Cameco and Kitsaki Management have expanded the LLRIB Grade 12 Scholarship Program for band members. Under the expanded program, Cameco contributes $50,000 to scholarship programs annually, based on matching contributions from LLRIB. In addition to the LLRIB’s $50,000 portion, Kitsaki Management Limited Partnership will also contribute $50,000 in 2018, for a total of $150,000 to be awarded to full-time post-secondary students. Up to 75 LLRIB post-secondary students can benefit from this revised program. The application deadline is August 31, 2018.